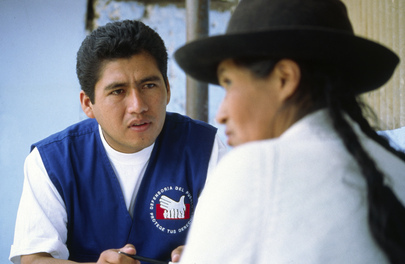 The implementation of large projects such as the Global Fund to Fight AIDS, Tuberculosis and Malaria (GFATM) represents a very significant investment in HIV/AIDS in Peru and a challenge to the administrative capacity of the country. To develop and implement the GFATM projects successfully requires new relationships between the public sector, civil society organizations, and vulnerable groups; however the analysis of these relationships and their impact on HIV/AIDS-related sustainable policies and policy changes is still pending. The objective of this paper is to explore the challenges that the national process of state decentralization in Peru presents to the constitution of regional multisectoral HIV-related coordination mechanisms (COREMUSAs) promoted by the GFATM and vice versa. With respect to HIV/AIDS-related policy, decentralization processes need to be strengthened and responsibilities and attributions of both national and regional government levels must be clearly defined. In those cases in which regional governments and civil society organizations were already active and organized, GFATM initiatives have generally helped to consolidate those processes. However when regional institutions were weak, GFATM projects did not trigger such processes.